On both Le Alpe d’Huez and Le Mont Ventoux, there are photographers who will take your picture and give you a card. 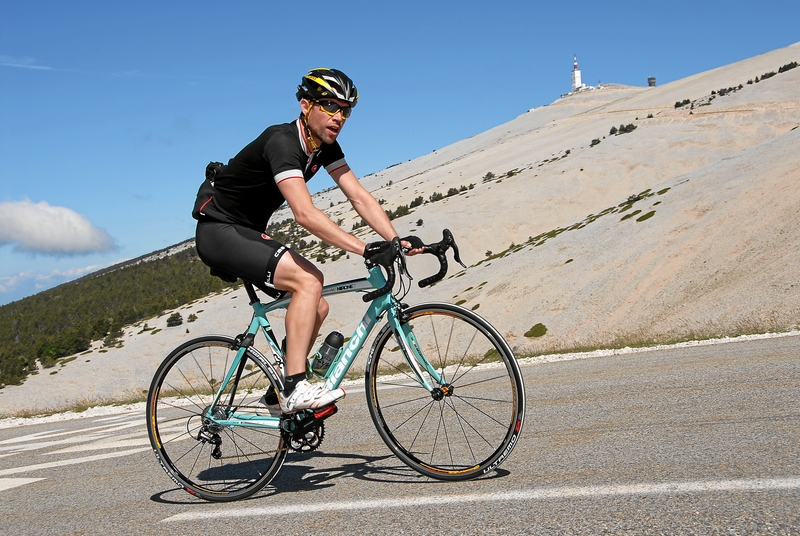 Both of these were taken by Griffe Photo on Ventoux. 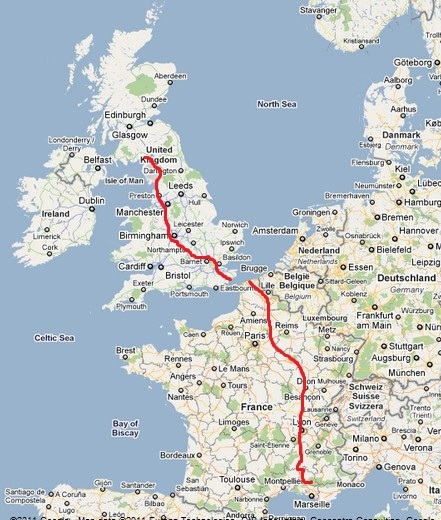 After driving almost the entire length of France, we changed our travel plans again as we realised we were going to hit Calais just before 1730. Managed to catch a train straight away and was back in Folkestone before 1800 UK time. A big push on the driving got us back into Carlisle around 0100. Quick run along the M74 to Annan and the first night in a real bed without the sound of (i) a monkey blowing a trumpet, (ii) bells, (iii) grasshoppers, (iv) dogs barking, (v) donkeys braying, (vi) cockrels crowing, and (vii) a large dutchman snoring in the next tent!!! Or as we have come to know them, the sounds of Bedoin and Ventoux! One last 210 mile drive and the Tour de Foley will be over. 2 hours 13 minutes, 2059 calories, 1912m (6310ft) of climbing and the summit was reached. Absolutely Baltic at the top after the effort so coffee and crepes were the order of the day. Helmets back on and a quick scooter back to the Tom Simpson memorial.20 minutes later we were rolling back to the campsite. Pasta for lunch and the took the car back up Ventoux from the other side. Unknowingly we also ended up at the summit of the Col du Madeline. Return travel has been brought forward as we have achieved everything we set out to do and now have sore legs. We should now be home Saturday afternoon. Bonus for me (J) is that I will be able to go to Lara’s first dancing show and will get a lie in on Sunday before being back to work Monday. The week has totally sped by and we have done something most people would only have dreamed of. Heading back into town now to buy pizza from Bernard Breslaws French brother!!! 2 hours and 13 minutes in the saddle.2059 calories burnt.1912m (6310ft) of climbing and the summit is reached. Day 5: The Alpe to Ventoux. Woke up to torrential rain. At this point the tent decided that after 16 years of being waterproof, it had decided to give up. With rain now dripping in, we quickly got up, took the tent down and said goodbye to The Alpe. We decided to make the 160 mile trip avoiding the toll motorways and seeing a bit of the countryside. First stop was at Gap where we went to see the spot where Lance Armstrong went offroading during the 2003 Tour. The field in question was much steeper than we had imagined and the drops at either side were huge. Having seen it for real made what you see on TV even more impressive. After leaving Gap on the back roads, fields of apples and fantastic gorges followed until we arrived on the lavender sided lower slopes of Ventoux. After pitching the tent and setting all of our wet stuff out to dry, we took a walk around Bedoin, took a load of photos and had a proper pizza meal for tea. Excited about Ventoux tomorrow but looking for less wind!! Rest day today with rain stopping play for most people round here. In a town where you can either go cycling up hills or go cycling up hills, not a lot was happening first thing. When the rain took a break, we took a drive up The Alpe and videoed it with the intention of posting it here. File size has prevented this so we will do it later when we get back. The drive up took us 22 minutes which is put into perspective when you think that Marco Pantani did this in a shade under 37 minutes on a bike after completing a 200km stage of the Tour which also consisted of at least two other HC climbs! After not getting the tent pitched on Sunday night, we rejigged our days to avoid a repeat performance in Bedoin tomorrow, and drove a total of 3 hours to watch the entire Criterium peloton speed past us in less than 20 seconds. This was totally unexpected given we had picked the top of a climb and had at least expected them to have the decency to go by at a speed where you could pick them out. I saw nobody of note but Bren stood on the other side of the road and ,even though he saw Bradley Wiggins, failed to push him to the ground for having stupid hair. On the way back, as it was still raining we thought we would have a drive to the top of the Col du Glandon however a combination of things made us decide to abandon the search. On the way we came across Claudio Chiappucci’s name still painted on a roadside barrier which must have been there since the late 80s. Erik Dekker still has his name up there as well! Just finished a tent made tea of freshly baked French bread, pate, jambon and the finest quality hot dog sausages, all washed down with flower flavoured Fanta (not the Lemon Fanta it looked like!!) and Leffe Blonde bier. Early(ish) start tomorrow to Gap for a look at the field Lance Armstrong rode his bike across, and then on to Bedoin and Ventoux.